If you want an appetizer-size stuffed mushroom—as opposed to finger foods/hors d’oeuvres—pick the portabella, the largest mushroom. This is Page 2 of a 5-page article. Click on the black links below to visit the other pages. While all mushrooms are fungi, they come in many varieties with unique textures, flavors and nutritional value. Here, we present the more common varieties and how to use them in everyday recipes, as suggested by the Mushroom Council (MushroomInfo.com). To find additional and more exotic types of mushrooms, check out our Mushroom Glossary. Beech mushrooms are petite with either all-white or light-brown caps. They have a crunchy texture that offers a delicately mild flavor that is both sweet and deliciously nutty. How To Use Them: Cook beech mushrooms whole or slice them into sauces to compliment chicken or fish dishes. They also taste great with vegetables and in stir-fry. Add to soups, stews or sauces as a last ingredient to maintain crisp texture. Button mushrooms, or white button mushrooms, are the most popular mushroom because they are the most inexpensive and the most widely available. They have a fairly mild taste and blend well with almost anything, although they don’t offer the more intense and dramatic flavor of other varieties. How To Use Them: White button mushrooms can be sautéed or cooked in any way, or enjoyed raw in salads. Try them sliced and sautéed on pizza, or in pasta, quesadillas or cheeseburgers. Crimini mushrooms, also known as baby ‘bellas or browns, are similar in appearance to white button mushrooms, but have a light-tan to rich-brown cap and a firmer texture. Criminis have a deeper, earthier flavor than white buttons. How To Use Them: Criminis They can be sautéed, broiled, microwaved or cooked in almost any way. Their hearty, full-bodied taste makes them an excellent addition to beef, wild game and vegetable dishes. Enoki mushrooms have tiny, button-shaped caps and long, spindly stems. They are milder in taste and crunchy. Before using, trim roots at cluster base. Separate stems before serving. How To Use Them: Try enokis raw in salads and sandwiches. Or use them as an ingredient in soups, such as a stock made with soy sauce and tofu. Maitake mushrooms are also called “Hen of the Woods.” They have a distinctive aroma and a rich, woodsy taste. To prepare maitakes, sauté lightly in butter or oil. 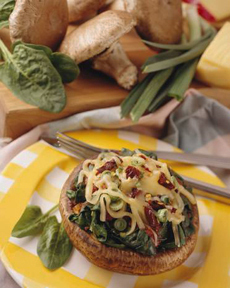 How To Use Them: Maitakes add a richer taste in any recipe calling for mushrooms. They can be a main dish ingredient or used in side dishes and soups. 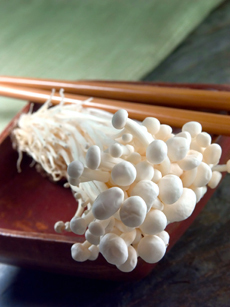 Photo of enoki mushrooms by Kelly Cline | IST. Oyster mushrooms can be gray, pale yellow or even blue. They have a velvety texture and a very delicate flavor. To bring out their flavor, sauté with butter and onions. How To Use Them: Try oyster mushrooms over linguine, with sliced steak and with red peppers sprinkled with grated parmesan cheese. Portabella mushrooms have a deep, meat-like texture and flavor. Portabellas can be grilled, broiled or roasted and served as appetizers, entrées or side dishes. How To Use Them: The hearty taste and texture of portabellas make them a flavorful vegetarian alternative; they can be grilled and served as “burgers” on toasted buns. Shiitake mushrooms have a meaty texture and are rich and woodsy when cooked. How To Use Them: Shiitakes add a meaty flavor and texture to stir-fry, pastas, soups, entrées and sides.